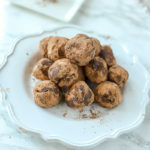 Vegan truffles are a decadent and delicious dessert. 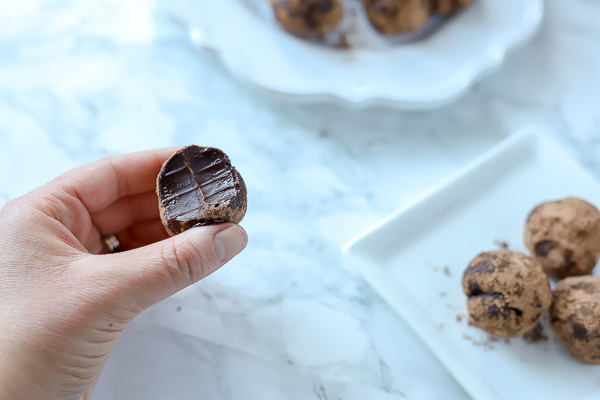 These super simple vegan chocolate truffles have a rich chocolate ganache center, and are the perfect dessert any time of the year. 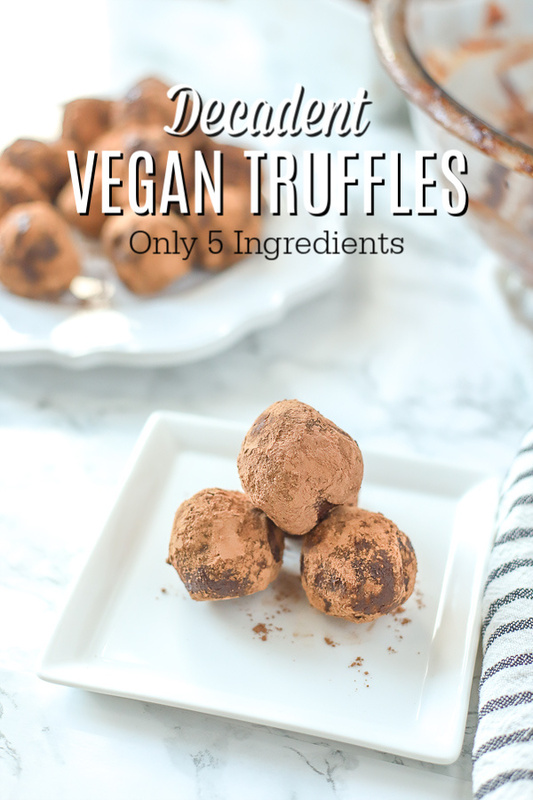 Follow my tips below to make these vegan truffles extra awesome. 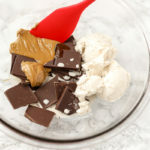 Ingredients you will need: 2 dark chocolate bars, coconut milk, nut or seed butter, maple syrup (or honey, if you do honey), and vanilla extract. Funny story: the first time I made, these the chocolate ganache was so thick and creamy, I thought I had done it… You know, made the perfect recipe the first time. How often does that happen? Not often. For a day or two, I would just scoop out the vegan truffles with my spoon and eat it happily. Then for my church group, I wanted to actually roll the ganache into truffles and have them all be my subjects… I mean, taste testers. That thick and creamy ganache just started melting into my hands when I went to roll it. I tried to move as fast as I could, rolling the vegan chocolate truffles into balls and then rolling them into the cocoa powder, but that didn’t help. For real, they ended up looking like poop balls. But at least my sweet poop balls tasted yummy; all my taste testers gave them a big thumbs up for deliciousness. But vegan chocolate truffles should be pretty, too, so I tweaked the recipe and now am ready to share it with y’all. Keep the truffles cool. If they get too warm, they may melt. When rolling them, it helps if the ganache is still pretty cool. Too cold and they will be a little harder to roll, but if they are too warm, they may melt a little too fast. Don’t worry about this too much, though. If you don’t get the right temperature, it still works and still tastes yummy. Swap out vanilla extract for almond or peppermint for a different delicious flavor. You will have to just play around with amounts to make sure you don’t add too much (especially with the peppermint). To make this truly vegan, use maple syrup. You could also add ground up nuts to make these extra yummy. Roll them in cocoa powder, dip them in melted chocolate chips, or roll them in crushed peppermint candies for awesome twist. What do you need to make this easy truffle recipe? Coconut cream (like this one) (I actually use Trader Joe’s brand but this one is similar)- the thick stuff from the can. No need to refrigerate it. Just skim off all the thick cream on top and then a little bit of the really white milk to make 3/4 cup. Try to leave as much as the translucent milk as possible. Nut or seed butter- I used sunflower seed butter (nut butter over here), but any creamy nut butter should work. Cashew butter would give it a more subtle and creamy taste. Liquid sweetener – Honey or maple syrup will work. Technically honey is not vegan, so make sure to use something else if you are a strict vegan. Vanilla extract (like this one)– see notes above for some variations. Cocoa powder to roll the truffles in. That’s it! 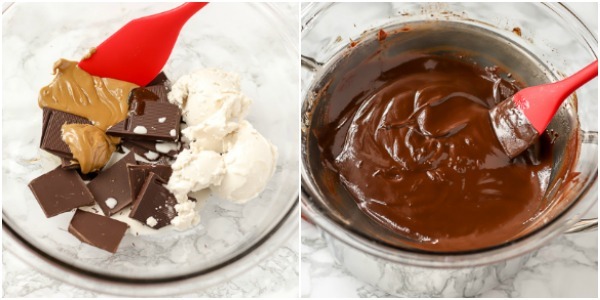 5 Ingredients to chocolatey amazingness. How do you make vegan chocolate truffles? 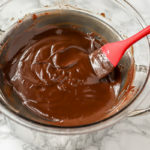 In a double boiler (you may also be able to do this in a microwave, but since we don’t have one I’m not positive), melt chocolate, coconut milk, nut butter, and honey or maple syrup. Basically just plop them all in a glass dish and melt them together. 2. Take it off the heat. Add in the vanilla extract and mix until combined. Place in fridge uncovered for 1-2 hours, or until ganache is completely cooled. 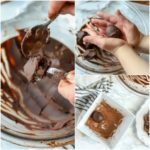 Spoon out ganache into hands and roll into a ball. Roll into cocoa powder or top with melted chocolate. These truffles are because they are made with coconut cream rather than dairy cream. Typical truffles are made with regular whipping cream, but since we avoid most dairy, I substituted coconut cream in its place. What chocolate is best for making Vegan Truffles? Use your favorite dark chocolate bar or chips. If you aren’t vegan, you could probably get away with using milk chocolate. I used a 72% cocoa chocolate bar. Need more delicious dessert ideas? Check these out! Vegan Fudge is so good. These vegan brownie bites are to die for. 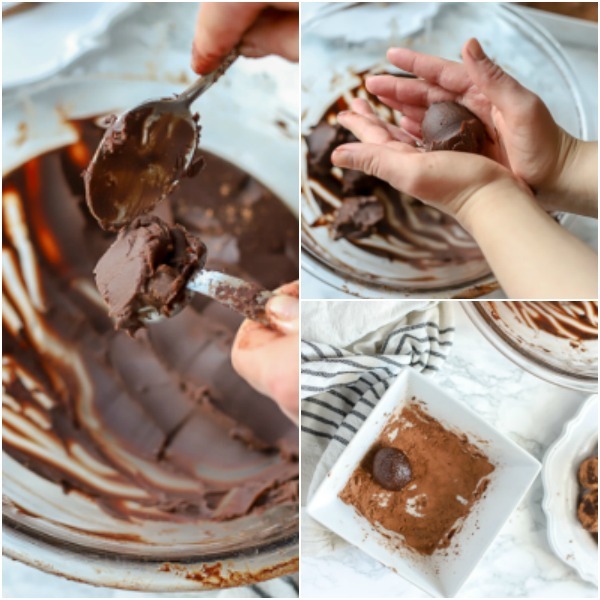 For the chocolate lovers out there, try this double chocolate dairy free ice cream! How amazing do these vegan Chocolate Mocha Cannolis look from Veggies Don’t Bite? Ridiculous amounts of chocolate? Check. This easy truffle recipe is so good. 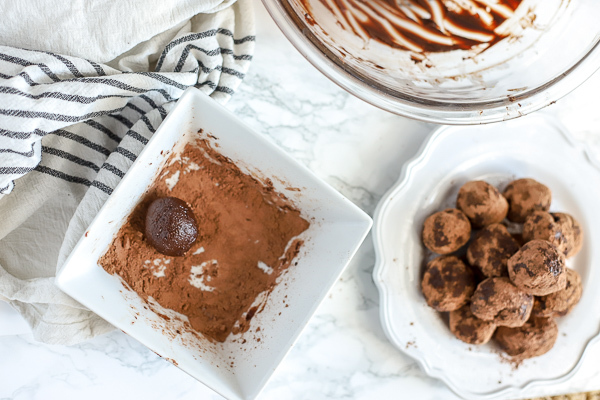 Decadent and delicious dessert, these super simple vegan chocolate truffles have a rich chocolate ganache center, and are the perfect dessert any time of the year. 3/4 cup coconut cream just the extra thick cream and not the really watery part. In a double boiler, place all the ingredients except the cocoa powder into a glass bowl over a pot of simmering water and melt until completely melted and combined. Place in fridge uncovered until it hardens, about 1-2 hours. Using a spoon, scoop out a small amount of truffle ganache and roll into a ball. Roll truffles in cocoa powder and place in a dish. Keep truffles cool. If they get too warm they will melt. When rolling them, it helps if the ganache is still pretty cool. To cold and they will be a little harder to roll, but if they are too warm they may melt a little to fast. Still works and still tastes yummy. Have you ever made truffles before? Yum! 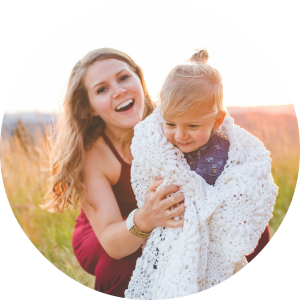 Super fun – my girls will love this special treat for Valentine’s Day! These would make perfect Valentine’s Day treats! I bet your girls would enjoy making them too.